Spritz Cookies, also known as Swedish Butter Cookies or Pressed Butter Cookies, are a very popular Christmas cookie, not only in Scandinavia, but also here in North America. They have a lovely vanilla flavor and a rich buttery texture that is tender crisp. As their name implies, “Spritz” is German for “spritzen” meaning “to squirt”, which is exactly what is done with this cookie dough. By that I mean we make these cookies using a cookie press (gun), a device that has a cylindrical barrel made of clear plastic and stainless steel with an easy-to-squeeze trigger, that “squirts” the soft dough through a decorative template giving us all sorts of wonderful looking cookies. We can make wreaths, flowers, trees, rosettes, stars, and stripes, to name a few. And while they are delicious plain, they look so pretty when decorated with candied cherries, nuts, colored sprinkles or colored sugars. include baking powder, but I find that the cookies maintain their shape better without it. This cookie needs a good unsalted butter and pure vanilla extract. I know that buying vanilla extract can be a challenge since it is very expensive and there are so many choices. I will admit that my first choice is Nielsen-Massey Madagascar Bourbon Pure Vanilla Extract that can be found in specialty food stores and by mail order. But there are other good choices that you can buy in regular grocery stores. Just make sure that it is labeled “pure”, and stay away from the ones labeled “imitation” vanilla extracts as they are made with synthetic vanilla (from glycoside found in the sapwood of certain conifers or from coal extracts) and leave a bitter aftertaste.
. Bake the Spritz Cookies until the edges of the cookies are just tinged with brown. These cookies can be stored about a week at room temperature or they can be frozen. 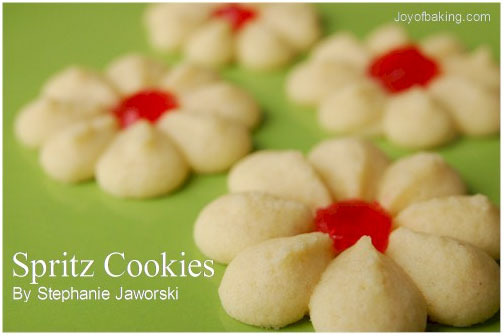 Spritz Cookies: Preheat oven to 350 degrees F (177 degrees C) and place rack in center of oven. You will need two ungreased baking sheets. In the bowl of your electric mixer, or with a hand mixer, beat the butter and sugar until fluffy (2-3 minutes). Add the egg and vanilla extract and beat until incorporated. On low speed, gradually add the flour and salt and mix until incorporated. Bake cookies for about 6-9 minutes or just until the edges of the cookies are barely tinged with brown. Remove from oven and gently transfer the cookies to a wire rack to cool completely. These cookies will keep at room temperature for about one week or they can be frozen for several months.